The benefit of aerating a lawn is that it allows air, water and nutrients to reach the roots of the grass, relieves soil compaction and removes unwanted thatch and foreign material. The Barreto 1320 13hp Hydraulic Rotovator is ideal for: Homeowners, Nurseries and Professionals suitable for the following applications Medium to large sized plots from light to heavy-duty soil conditions. can have this in leaf blower or vacuum mode. Powered by a 163cc OHV 4-stroke engine and weighs 54kg. The bulky weight and the powerful engine work hand-in-hand to ensure that you are able to dig and cultivate the land with ease. 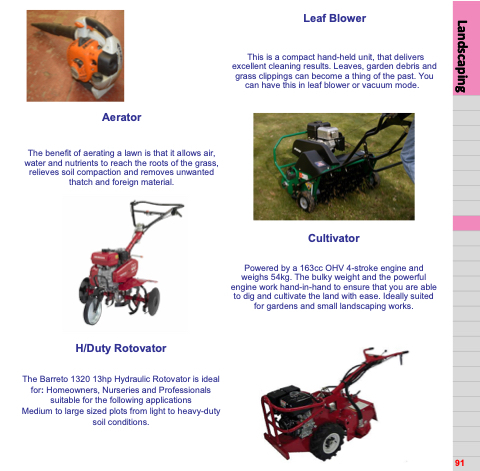 Ideally suited for gardens and small landscaping works.